« ABA Assessment: What Should I Ask? Yesterday we discussed questions to ask an ABA provider during an assessment. Today we will address what to expect in an ABA assessment. We would like to clarify that this process should not be limited to ABA providers only. A full and initial evaluation of a child as part of the special education process should also follow this model. Currently, the field of ABA has no rules and regulations regarding initial assessments for ABA services. Thus, each agency will follow its own assessment protocol. Early intervention and special education services, on the other hand, have specific rules and regulations regarding assessments. You will find more information about those rules here for children age 3-22 or here for children under the age of 3. We will attempt to describe a variety of assessments commonly conducted as part of an assessment for children with autism. Our advice to you is to become informed so that you know how to ask for assessments that your child needs. We have described the different types of assessments on our website. In summary, your child should have a formal diagnosis so that the severity of autism is documented. The diagnostic assessment should be conducted each year as one measure of your child’s progress. The diagnostic assessment should be completed by a licensed psychologist. Texas Education Agency has a helpful list of diagnostic and screening tools related to autism. Following the diagnostic assessment and before services begin, your child should have a comprehensive developmental assessment for every area of development. Our recommendation is that norm-referenced assessments be completed annually as a second measure of progress. At a minimum, your child should be assessed in speech and language, adaptive skills, fine and gross motor, social and emotional development, and cognition. The Texas Education Agency has provided resources related to developmental assessments here. The developmental assessments provide information about where your child is functioning compared to his/her same age peers. Norm-referenced developmental assessments should not be used to develop program goals and objectives. Your ABA provider may provide some or all of the aforementioned assessments depending on the type of personnel employed by the agency. In order for an agency to develop a program for your child, other types of assessments will be needed. These are the assessments we will focus on. A number of criterion-referenced assessments are available for use by ABA providers. The Brigance is a widely used assessment with substantial research to support its reliability and validity. This assessment provides information about the skills children have acquired as well as what skills should be learned next. The assessment covers all areas of development and may be repeated as a measure of progress towards goals and objectives. The Brigance has been used to assess children with and without disabilities and is not autism specific. The Verbal Behavior Milestones Assessment and Placement Program (VB-MAPP) is an autism specific assessment that may be used to determine which skills a child has mastered as well as which skills should be taught next. The VB-MAPP focuses on language and challenging behaviors. Thus, additional assessments should be used in combination with the VB-MAPP. Peer-reviewed research studies regarding reliability and validity are still needed. The Assessment of Basic Language and Learning Skills (ABLLS). The ABLLS provides information regarding skill development in a number of areas including language, social interaction, self-help, academic and motor. Peer-reviewed research studies regarding reliability and validity of the measure are still needed. We mentioned the SKILLS assessment and curriculum yesterday. This tool assesses skills in all areas of development. Unlike the ABLLS and VB-MAPP, peer-reviewed studies have been completed on the SKILLS. Providers of services for infants and toddlers may use an assessment called the Hawaii Early Learning Profile (HELP). This tool has substantial peer-reviewed research related to its reliability and validity. The tool is also comprehensive and assesses all areas of development. The tool is designed to develop IFSPs and would thus be appropriate when developing your child’s ABA program. However, the assessment should not be used to determine your child’s eligibility for services. Your provider may use other measures for program development. These may include checklists, rating scales, and parent report/interview. Other standardized assessments are available for your ABA provider to complete. These assessments may or may not be used during the initial assessment. They will most certainly be used over the course of the program. When children engage in challenging behavior, a functional behavioral assessment (FBA) is required in order to assess the behavior and develop an appropriate Behavior Intervention Plan (BIP). At a minimum, the assessment will include a record review, parent/teacher interviews, and direct observations of your child. 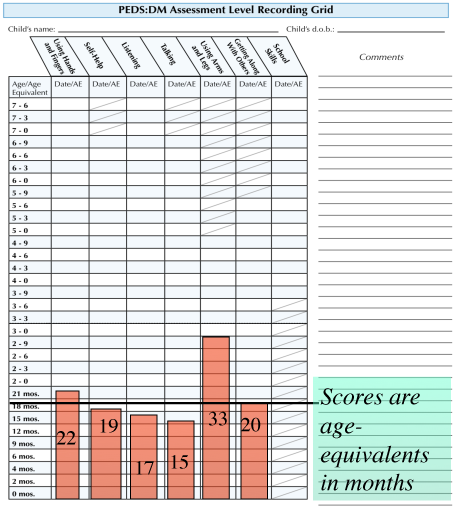 Providers may also use rating scales completed by parents and/or teachers. Finally, providers may complete a functional analysis where conditions are manipulated to assess how environmental changes affect your child’s behavior. At some point in a program, providers will complete preference assessments for your child. Formal preference assessments include the systematic presentation of items to determine if your child interacts with or engages with various stimuli. Informal preference assessments may be completed on a daily basis in order to determine how to best motivate your child to work. The provider may simply watch how your child uses toys and which toys your child gravitates toward during free play. Providers may also ask you to limit your child’s access to highly preferred toys and activities to keep him/her interested in them during therapy. ABA providers, early intervention personnel, and school staff may also complete a number of informal assessments. Most likely, they will request copies of records from your child’s medical and related service personnel. A comprehensive record review is almost always utilized during program development. Providers may create agency specific forms they use when developing programs. Providers may also ask families to complete intake forms in order to gather information from parents and other providers. Completing and returning these forms as soon as possible will help your provider prepare for any upcoming visits or assessments. Providers may complete observations of your child in a variety of settings such as home, school, and community. Providers will be able to develop better programs after observing your child in as many different settings and activities as possible. It will be important for providers to observe your child under his/her best performance. However, it is equally important for providers to be able to see situations when your child is not successful. Providers may also complete skill probes. These are mini-tests where the provider asks your child to engage in a skill to see if your child complies or if your child is capable of performing the skill. For example, the provider may introduce a toy set. After playing with your child for a few minutes, the provider may ask the child to find a red car. The provider may document if the child completes the skill as asked. Skill probes may be conducted prior to program development. However, they may also be completed within the first couple of weeks of your child’s program. As we have stated, this list is certainly not comprehensive or all-inclusive. Hopefully, it will help prepare you for your child’s initial assessment and program development. Has your child recently completed an assessment? What would you add to help first timers through this process? BCBAs in California have had NO training in how to handle severely autistic people who engage in severe self injurious behavior. They have no clue what they are doing. It’s scary. Nor have the BCBAs been trained to consider any medical issues that are fueling behaviors, but then again that should be in collaboration with a nurse, right? Right. You raise an interesting point about training for BCBAs. While the BACB has identified basic skills for a beginning BCBA, the BACB has not identified other skills that BCBAs should learn. The guidelines for responsible conduct of a BCBA are quite clear that BCBAs should not take cases without appropriate training in the area of targeted need. Thus, as you have recognized, a BCBA should NOT be addressing severe self-injurious behavior if they have not had extensive training and supervision in severe SIB. You and I (and the other well-trained folks) know that underlying medical issues can be reasons for SIB. Hi, my ABA provider assessed my son making me fill out an ABAS questionnaire and tells me that my kid is at normal range. Is this assessment accurate in order to set up an in-home program? Shouldn’t they observe my son? Thanks! Hi Aliena, thanks for stopping by our blog. This is actually an excellent question. First, I’d want to make sure that the evaluator has been trained in administering a norm-referenced assessment. These types of assessments have rules about administration as well as scoring. I am not familiar with the research on this particular tool so I will look to see if there is any regarding the tool’s validity. And finally, I would want to know the intended purpose of their assessment. Did the team administer the assessment as part of an initial or triennial within the educational system? Or did they complete this assessment to develop an ABA program for your child? The bottom line is that no assessment, whatever the purpose, should be completed without the evaluator observing the child. The tool is merely one step of the assessment process. I will follow up with a new blog on this very topic. However, I also encourage you to read on our website the difference between a norm-referenced and criterion-referenced assessment. Be sure to raise your concerns with the evaluator when he/she reviews the assessment results with you. Many thanks for your reply!! The evaluator and current ABA provider set up a program for my son 6 months ago, just based on informal observation and parent interview. We were getting 4 hours per week. When I raised my concerns about too low goals, he decides to reassess with ABAS, that is norm-referenced, but it consists on me answering a qualitative questionnaire about my kid’s functioning. The questions are very general: “does he mand?” My son is high functioning so the results of ABAS fall in normal range. Based on my own bias answers they decide that hours will be reduced. I am just astonished. Would you be able to point me in the direction where I can find supporting documentation that FBAs are standardized assessments?